Hi Ben. Thanks for reporting these bugs. The sound menu uses MPRIS to find out about and communicate with media players on the system. MPRIS doesn't support passing the timestamp of the click to the media player, which is needed for focus stealing prevention. We're trying to get it into the spec. 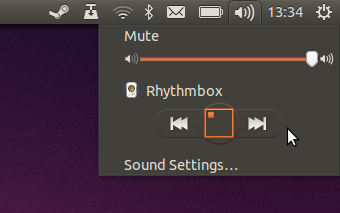 We used to have some hacks for gtk applications, which got lost in a recent refactor of indicator-sound. The last issue you mentioned (the orange square) is tracked in bug #1231796. All of the problems I reported are continuous, they always happen as described and never function properly. The translucent popup notifications are fine, they show track info and album art as expected. The problem with track info and album art is that it is _never_ displayed in the sound menu since installing 13.10. Can I provide any more information for you? It seems like Rhythmbox wasn't running while you executed that command. If it wasn't, could you please try again with Rhythmbox running? My problem is very similar, but notifications (translucent ones) doesn't shows, just like covers in Sound Menu. Your copies of Rhythmbox don't export the MPRIS dbus interface which is needed for the sound menu to discover and manipulate media players. Do you have the MPRIS plugin enabled? 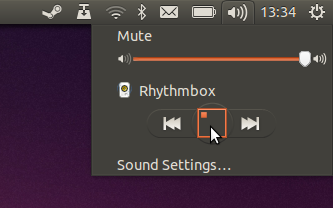 Like I wrote in comment in https://bugs.launchpad.net/ubuntu/+source/rhythmbox/+bug/1283269, after reinstalling Rhythmbox, Rhythmbox plugins and packages related to Sound Indicator and notifications, everything works as expected. I can't tell, if earlier I had the MPRIS plugin enabled, or not - now is enabled. MPRIS plugin needs to be enabled, just tested it. Nontheless a strange behaviour that the functions are displayed though not available. The problem is that MPRIS provides no way for the sound menu to find out when an application stops exporting player functionality. So if you've had the plugin enabled once, the sound menu will continue to display rhythmbox even after you've disabled the plugin again. You can remove media players from the sound menu manually by modifying the com.canonical.indicator.sound interested-media-players gsettings key in dconf-editor. I know a real patch would help more, but I don't know how to create one yet. From what I see this would require a restart of indicator-sound if the MPRIS gets re-enabled, but no sound items would be displayed if the proxy is absent. Just noticed that the proxy may not be ready in time when the menu gets initialized. So this approach could break the default with MPRIS enabled anyway. Doing the has_proxy check in update_playlists looks like an ugly hack, guess the bug is not worth the effort? Just to add: the rhythmbox-plugins package was not installed by default here too (14.04 beta 2). Only after I installed it, the back/play/next buttons in indicator-sound started to works. zomtir, thanks for looking into this. However, we can't make this dependent on the proxy being available, as we want to allow starting recently-used players from the sound menu as well. I was affected by this bug, too. 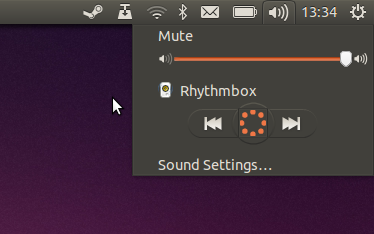 The "rhythmbox-plugins" package was correctly installed by default with my Ubuntu 14.04 installation. Going to "Tools" -> "Plugins ..." and enabling " MPRIS D-Bus Interface" ( restarting Rythmbox afterwards ) fixed the issue for me. I'm been working on the sound indicator for a few weeks running vivid in the desktop and I've never observed the described issue. Taking into account that the bug was reported on 2013, I'm not sure if it should be tested by anybody from QA and confirm if it's fixed. is that still an issue for anyone on current versions? Just trying this in xenial. I've been checking this and I can confirm the issue in xenial. Clicking at the next/previous buttons does not send the expected dbus message, so something in the indicator might be wrong. The play/pause button seems to be working fine, though. In relation to having the focus in rhythmbox ... it depends on if the application was started by the indicator or by its own. If the application is NOT started from the sound indicator then clicking on its name on the indicator does not focus the player. To fix the issue with the Next/Previous controls. The problem was that, when the playlist was included in the player controls section, we were not updating the state of those buttons. I saw that when starting the application from the sound indicator if the application is out of focus and you click the name of the application in the sound indicator...it comes to focus as expected. If you launch the application by itself, it's out of focus and you click on its name in the indicator, then the icon wiggles in the launcher, but is does not come to focus. Checking at the dbus messages, I see that the indicator is sending the right message (in fact the application is receiving it as its icon wiggles). I've tested that with Banshee, GMusicBrowser and Rhythmbox... all 3 application have the same behavior.